The Miami Dolphins were the defending AFC Champions and looking to return to the Super Bowl as they faced the New England Patriots in the conference title game on January 12, 1986 at the Orange Bowl. Head Coach Don Shula’s Dolphins, after a 4-1 start in 1985, had struggled during a midseason slump that reduced their record to 5-4, including a loss at New England. But they proceeded to win their last seven games to again top the AFC East at 12-4. QB Dan Marino, coming off a record-setting year in ’84, held out during training camp and WR Mark Duper missed nearly half the season, but the high-flying aerial attack still had WR Mark Clayton (70 catches, 996 yards), 34-year-old WR Nat Moore, and RB Tony Nathan accumulating nearly as many yards as a receiver out of the backfield (651) as he did as a runner from scrimmage (667). Marino’s numbers might not have been as astronomical as they were a year earlier, but he still led the NFL with 4137 passing yards and 30 TD passes. A chink in the defensive armor was noted in the AFC Divisional round win over the 8-8 Cleveland Browns in which the Dolphins struggled and gave up 251 rushing yards. New England, under Head Coach Raymond Berry, had a reputation as a talented team that was prone to underachieving. The Patriots got off to a 2-3 start but went 9-2 the rest of the way (including a split with the Dolphins) to finish third in the AFC East at 11-5 and in the postseason as a wild card entry. Deposed as starting quarterback by Tony Eason, Steve Grogan stepped in when Eason was injured and performed well. 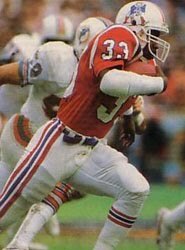 FB Craig James (pictured above) earned a Pro Bowl berth as he ran for 1227 yards while HB Tony Collins contributed another 657 yards and caught 52 passes for 549 more. Wide receivers Irving Fryar and Stanley Morgan were outstanding. The defense featured linebackers Andre Tippett and Steve Nelson, CB Raymond Clayborn, and FS Fred Marion. The Patriots beat the team that finished second in the division, the Jets, in the Wild Card round and then upset the Raiders in Los Angeles to earn a shot at the AFC title against a team that had beaten them 18 straight times at the Orange Bowl. There were 74,978 fans in attendance on a wet and cloudy day in south Florida. Following a 37-yard kickoff return by New England WR Stephen Starring, the Patriots made it to the Miami 45 and had to punt. On the Dolphins’ first play from scrimmage, Nathan fumbled after being hit by Nelson and DE Garin Veris recovered for New England. Six plays later, barefooted PK Tony Franklin kicked a 23-yard field goal and the Patriots had the early lead. The teams traded punts, and as the first quarter came to an end the Dolphins were in the midst of an 80-yard drive. Marino connected on passes of 12 yards to TE Bruce Hardy, 18 to Duper, and finally 10 yards to TE Dan Johnson in the middle of the end zone for a touchdown. Fuad Reveiz kicked the extra point and Miami was ahead by 7-3. New England came right back, going 66 yards in eight plays highlighted by a 45-yard run by RB Robert Weathers. Eason threw to Collins for a four-yard TD and the Patriots were back in front. New England regained possession thanks to another fumble, this time by Marino on the Dolphins’ second play of the next series. NT Lester Williams recovered for the Patriots at the Miami 36 and they drove to another score in seven plays. Craig James ran for 23 yards on three carries and Eason threw to Morgan for 12 yards and a first down at the one yard line. The third-year quarterback then rolled out and tossed a TD pass to TE Derrick Ramsey and, with Franklin’s PAT, the Patriots were ahead by 17-7. The Dolphins drove from their 17 to the New England 14 with Marino making big completions of 16 yards to Clayton and 29 to Hardy. But they came up empty when Reveiz missed a 31-yard field goal try. The clubs traded punts to finish off the half and New England maintained its 10-point lead at the intermission. The Patriots got a big break on the kickoff for the second half as Miami RB Lorenzo Hampton fumbled after being hit by RB Mosi Tatupu and WR/RB Greg Hawthorne recovered. Starting at the Dolphins’ 25, the visitors scored in six plays with James and Collins running the ball effectively and Eason passing to Weathers for a two-yard touchdown. Franklin kicked the extra point and New England’s lead was now 24-7. Marino threw three incomplete passes on Miami’s next possession, but the Dolphins got a special teams break of their own when Reggie Roby’s punt was fumbled by safety Fred Marion and recovered by safety Bud Brown. 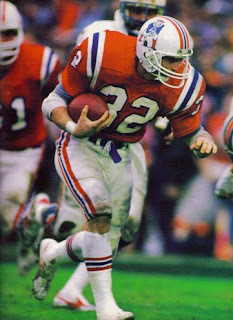 With the ball at the New England 42, RB Joe Carter ran for a 19-yard gain and Marino threw to RB Ron Davenport for seven more to the 16 yard line. But a pass into the end zone intended for Clayton was intercepted by Marion – making up for his turnover – and the Dolphins came up empty. The Patriots put together a 13-play drive that consumed nearly eight minutes with Collins, James, and Weathers carrying the load on the ground – Eason threw just one pass, a six-yard completion to Tatupu. However, after getting to the Miami 24, New England also came up short when Franklin’s 41-yard field goal attempt was wide to the left. Still, the Patriots maintained a 17-point lead going into the final period. Three plays into the fourth quarter, the Dolphins punted, and once again the Patriots turned the ball over as safety Roland James fumbled. Miami gained possession on the New England 10 and immediately capitalized as Marino threw to Nathan for a TD. It was now a 24-14 contest with plenty of time remaining. It looked even more favorable for the Dolphins when the Patriots went nowhere in three plays and punted. But two plays later, and with the ball at the Miami 38, it was the turn of the Dolphins to fumble the ball away as Carter lost the handle and 14-year DE Julius Adams recovered for New England. Again, the Patriots kept the ball on the ground as Craig James ran four straight times and Collins three consecutive, including a carry of 14 yards to the Miami 17 on a third-and-seven play. After a three-yard run by Collins, James went 13 yards to the one yard line, and Tatupu finished the nine-play drive off with a touchdown carry around end. In effect, the Patriots had put the game away, but there was still 7:34 on the clock and Marino came out throwing. Hitting on six passes, the Dolphins moved from their 21 yard line to the New England eight. The drive stalled there, however, and two penalties moved Miami back to the 28 from where a Marino toss into the end zone was intercepted by Raymond Clayborn. The Patriots kept the ball on the ground and, while Miami sent all eleven players after Rich Camarillo’s punt, it sailed 49 yards and came to rest on the Dolphins’ 14. By then, there was no longer any doubt and New England advanced to the Super Bowl with a stunning 31-14 win. The Patriots had more total yards (326 to 302) and first downs (21 to 18) than Miami. Of the yardage total for New England, 255 came on the ground and just 71 through the air (as opposed to 68 and 234, respectively, for the Dolphins). Most of all, while the Patriots turned the ball over twice on fumbles, Miami lost the ball a costly six times. Combined with the other two playoff wins on the road, New England came away with a total of 16 takeaways in climbing to the pinnacle of the AFC and becoming the first wild card team to win three road games to advance to the Super Bowl. Craig James paced the New England running attack with 105 yards on 22 carries while Robert Weathers carried 16 times for 87 yards and Tony Collins (pictured at right) contributed 61 yards on 12 attempts. Tony Eason went to the air just 12 times but completed 10 for 71 yards with three touchdowns and no interceptions. Collins and Derrick Ramsey caught three passes apiece (for 15 and 18 yards, respectively, and each with a touchdown) while Stanley Morgan gained a team-high 30 yards on his two receptions. Dan Marino was successful on just 20 of his 48 passes for 248 yards with two TDs and two interceptions. Tony Nathan was Miami’s top receiver with 5 catches for 57 yards and a score (he gained four yards on two carries). Mark Duper and Mark Clayton caught three passes each, for 45 and 41 yards. Bruce Hardy gained the most receiving yards with 52 on his three receptions. Joe Carter rushed for 56 yards on 6 carries, but had the one big fumble. The surprising run through the postseason came to an end for New England against the 15-1 Chicago Bears in the Super Bowl. The Patriots were crushed by a 46-10 score. They won the AFC East in ’86 but lost in the Divisional round and didn’t reappear in the postseason until 1994. Miami was 8-8 the next year and didn’t return to the playoffs until 1990 despite Dan Marino’s continued heroics.